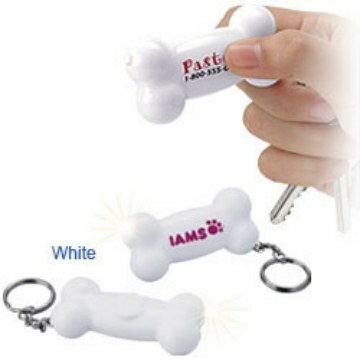 Wholesale Personalized Dog Bone Flashlight Key Chains. Promotional, Inexpensive. Best price in USA, Canada. Bulk dog bone key chain flashlights with bright White LED and fast production. The Dog Bone Flashlight Key-Ring utilize LED light bulbs and lithium batteries. Lithium batteries can provide shelf life up to 10 years, and LED light bulbs provide best life for battery use. We also supply blank dog bone flashlight key chains at the next-column price. Budget Prices for USA, Canada for personalized dog bone key chain flashlights. American clients pay no taxes. Prices below include your 1 color custom imprint. The unit prices are for the standard production of 5 working days. We also supply blank dog bone flashlight key chains at the next-column price. Setup Charge: $40.00 per color, no setup charge for repeat orders. Imprint Area: Top: 1 3/8"x3/8"
Decoration: includes 1 color / position pad print. Plate Charge: 40.00 per color / position. Production Time: 5 working days after artwork approval.